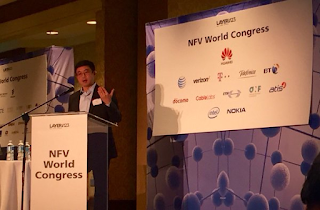 Speaking at Thursday’s April 21, 2016 NFV World Congress in San Jose, CA, Geng Lin, Head of global engineering in emerging markets at Google Access (part of Google parent company Alphabet), described his division’s strategy in improving Internet access and affordability in developing countries. He then cited India RailTel WiFi as a real world “case study” of extending Internet access to millions of new users via a managed WiFi network designed and developed by the Google Access division. There are 3.2B unique Internet users worldwide of which 2B are from developing countries. Yet 4B people in developing countries remain offline, which is two thirds of that population. India is the most promising market for Google Access, while other markets include Indonesia, Brazil, and sub-Sahara Africa. Fiber/Wireline combined with terrestrial wireless for high population density areas. Aerial wireless (balloons) combined with terrestrial wireless for medium density areas. Aerial wireless (balloons) combined with satellite/space communications for low density areas. *Geng's comment (via email): "Each of the transmission technologies noted above can be used for both access and backhaul for the respective density areas." India is a key emerging market for Google Access as there’s only 20% Internet penetration in a country of 1.2B people. Mobile users comprise 60% of the Indian population, but many only have cellular voice/text with no Internet access. There are only 200M smart phone users (16% of the total population) in India. With 100M new Internet users in the last year (2015) and many more wanting connectivity in coming years, there’s huge potential to significantly grow the number of broadband Internet users in India. Last fall, Google announced in a blog post that it was partnering with state owned India Railways and India's RailTel (which owns a Pan-India fiber optic network on exclusive Right of Way along railway track) to provide WiFi based Internet access in 400 Indian train stations. The WiFi to be deployed is much more than "best effort" transport, Geng said. It's a highly reliable, managed WiFi network: "This is a WiFi service that operates as a highly managed service, You could think of it as carrier class,” he added. Many new Indian Internet users are expected each week when the managed WiFi network is fully deployed. The service was turned on in January 2016 in Mumbai's central station as per this WSJ article. More train stations have been added this month (see Sidebar below). When fully deployed, it will be the world's largest WiFi network! “Everyone who comes here will get high quality, high-definition streaming,” said Gulzar Azad, head of access programs for Google in India. He said 100,000 people pass through Mumbai Central station daily. At the station, users will be able to get high-speed Internet for the first hour. Then the speed slows to “normal,” Mr. Azad said. The Wi-Fi service is available on all the station’s platforms, but cuts off as soon as one steps outside the station. 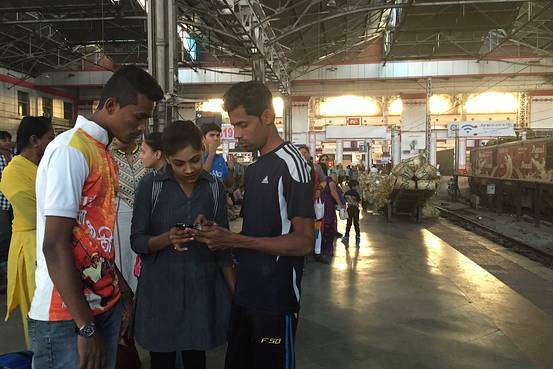 Passengers at Mumbai’s railway station try out Google’s free Wi-Fi service on Jan. 22, 2016. 1. Cloud based Evolved Packet Core (EPC) control plane, which can massively scale to accommodate millions of new users. 2. Cloud platform based Service Operations for service level modeling, monitoring, and reporting (i.e. OSS type functions). Google's cloud-based service operations is also delivering advanced analytics and service level monitoring to improve the customer experience. The third piece of this managed network is the WiFi Radio Access Network (RAN), which is composed of WiFi Access Points (APs) and wirless LAN controllers. It's fully automated with minimum staff required for maintenance. Google is leveraging India Railways 45,000 km fiber optic backbone network for WiFi backhaul to Indian ISPs (not disclosed). There's evidently fiber optics cable to each train station in India that will have managed WiFi access. -->Google combines and integrates the Wi-Fi RAN with their cloud based EPC to provide the total access network which is connected to India RailTel's fiber optic backbone to reach the ISPs point of presence. Google's service operational cost is expected to be sub $ per month per subscriber. Geng's clarification comment via email: "What I described was the service operation cost. However, we didn't calculate the cost of fiber bandwidth etc. which we're not able to know until we have more data." Users in India are flocking to the service, which is currently being offered at no charge. Long-term, Google plans to offer a paid service, but it will also offer some level of WiFi service for free. End to end service stability has been superb so far, with 99.94% availability in the last week, according to a report Geng said he printed out Thursday morning. That makes for a great Internet user experience! 10 WiFi enabled train stations have been deployed since January 2016, with a total of 100 stations to be WiFi enabled by the end of 2016. The list of train stations is here. "The network is now live in 10 key stations across the country and will enable about 1.5 million people to access high-speed Internet service. We are scaling up our efforts to roll out the network quickly to cover some of smaller stations where connectivity is much more limited," Google India head of access project Gulzar Azad told PTI. The aggregated WiFi train traffic has grown by 700% in the past month. Current average usage time is about 50 minutes per day or 366M bytes per user. “This is more intensive usage than an LTE network user,” Lin said. Users can download HD videos and watch mutli-media apps on their mobile devices without interruptions. 400 WiFi equipped train stations with a total of 10M daily new Internet users in India are projected in coming years as this project nears completion. 1. It should be noted that Google’s free WiFi will only work at the railroad platforms and is not meant for use within the trains. According to Marian Croak, Google VP for Access and Emerging Markets, the company sees a potential of 10 million users accessing its WiFi each day by the end of 2016 from across these railway stations. Google wants to make sure that these 10 million users get broadband quality experience when using its managed Wi-Fi network. 2. In an effort to compete with Amazon's AWS, Google’s been on a growth spurt with its Cloud Platform (AKA the global Google Compute Engine), which manages and controls this WiFi network. Last month the company said it is adding 12 regions (i.e., data centers) by the end of 2017. 3. Google's huge infrastructure of advanced data centers are a big driver of capital expenditures that hit nearly $10 billion last year. Many of those data centers are used to create Google's Cloud Platform. Google's cloud based EPC and cloud based service operation will scale to tens of millions of users for this WiFi Railtel project. The network architecture is extensible to possibly reach hundreds of millions or even a billion users by leveraging Google's cloud data center platform. Geng's comment via email: "While conceptually correct, this perhaps is still a bit early to make a strong defensible statement." The cloud EPC and cloud based service operation could also be offered as a wholesale service on the Google Compute Engine to incumbent carriers (not disclosed) that Google is now partnering with for the WiFi RailTel project. Revenue from what Google/Alphabet calls “Other Bets” or "Moon Shots" — including its Google Fiber business, driverless cars (autonomous vehicles) and the Nest thermostat — was $166 million, more than double what it was in the first quarter of 2015. However, losses for "Other Bets" rose to $802 million in the last quarter, from $633 million. Presumably, the "Other Bets" include Internet access via WiFi balloons and the managed WiFi network for India RailTel/India Railways. The majority of those costs, according to Alphabet CFO Ruth Porat, are driven by the expense of building out Google Fiber. Alphabet plans to increase spending on bets that show promise, ask outside investors to contribute where it makes sense, perhaps around driverless cars, and cut down on bets where multiple teams are pursuing a similar objective. Google CEO Sundar Pichai cited the development of machine learning and artificial intelligence as one of the key factors driving the company's growth. It remains to be seen if the company can turn any of these research intitiatives into a real profit making business. b] FB has a walled garden with access limited to a FB-chosen set of websites. -->Geng said Google will not do location- or subscriber-based advertising. I think he hinted that FB does this or will be doing it in their network? 1. Google makes its large majority of revenue on search hits, which this service will open up to more people. 2. Google and FB are in a race to capture the billions of internet-unconnected on the planet, thus their service is designed to be different than FB service. I am thinking of the technical challenges of operating a WiFi network in a rail station, and I am realizing that this is a great accomplishment. First, I expect that rail stations have time-varying noise sources of an electromechanical nature, which are associated with the arrival and departure of trains. Without proper measures, this noise would leak into receiver components and would degrade performance. Second, the hardware must be very resilient to mechanical stress, e.g. vibrations. The requirements from such hardware should be much more strict compared to typical equipment that is rated for outdoor use. Certainly programs which do not restrict free Internet access, such as that provided, according to this report, by google, are preferable to those undesirable and appalling programs which restrict web page access to a provider-approved subset of the free Internet such as that proposed by Facebook "Walled gardens". The previous commenters concept of "success" and "successful" appear to be tainted by the neoliberal concept that, in order for an activity to be "successful", one must realize a (short-term and discernable) "profit" on an activity that they undertake. In the case of google, at least, and most modern thinkers, this is clearly an outtmoded and obsolete idea. As always, thank you Alan for bringing valuable insights to readers of this portal. At the outset, I think Google will succeed where Facebook failed (with its "Free Basics") largely because the monetization model for Google is quite clear and it is in search. There was widespread opposition in India to Facebook's free internet effort which was crudely positioned as 'free' while it really was not! Google can therefore offer it free, how ever there is nothing in the article above or other sources to say it will stay that way in future years or that Google can choose to offer tiered pricing for faster browsing. I think Google's success is somewhat insured to begin with in the Indian railway stations' deployment -getting permits (though not always expedient) is guaranteed since it has the Primer Minister's blessing. But scaling this to 500 stations could be a challenge. There is also the risk of privitization as some sectors in India have seen in recent years. What would be personally interesting to me is to hear about what Google's plans are for expanding the internet access to rural areas in India -the sheer number of people getting online is so attractive that the huge revenue potential is well-worth the investment. So the question I have is what solution would Google choose to scale this to hundreds of thousands of villages in India. Copyright © 2018 IEEE Communications Society – All Rights Reserved.